Sniper Voice Actor's Book Picks Up Plugs from Team Fortress 2 "Reviewers"
You may not be familiar with the name "John Patrick Lowrie." 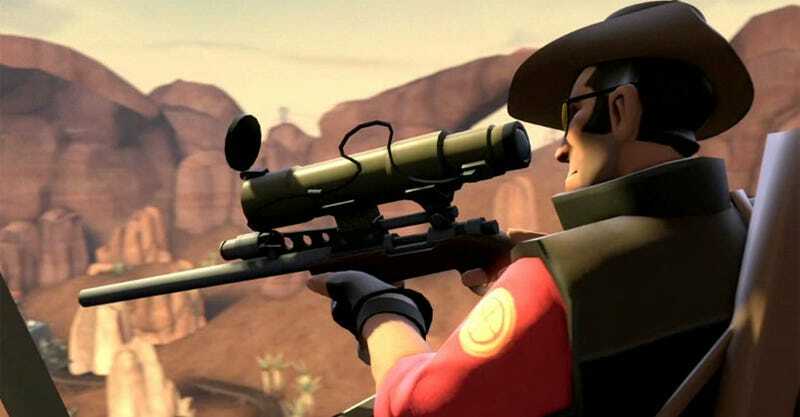 You probably are familiar with the name "Sniper," whom Lowrie voices in Team Fortress 2. He's just published the novel Dancing With Eternity and, well, his friends are giving it some kind reviews on Amazon. Even if cannot read, you will like. Book is heavy so I throw at spy. He will never ever walk again. Scout gave it the lowest review, four of five. It was a good book, don't get me wrong. I don't normally read y'know, because I'm busy busting heads and capping points, but when I found out my friend Sniper wrote a book, I had to get it. I give it 4 stars. Would have been 5 if it had come with a hat. Mra mreananna menrannen mrrnin mroonh. Mah mranahhana mrorm mre maranahananranmnh mron mrnmrhn mrnmrnre. Mrumanhanna muranna mrunahhmphna mrump. Mrumnamahanna. What more needs be said? Order below.